Offer super capacitor power storage solutions for various types of new energy vehicles, and provide efficient, reliable, safe and intelligent power storage unit for starting, acceleration and braking energy recovery. 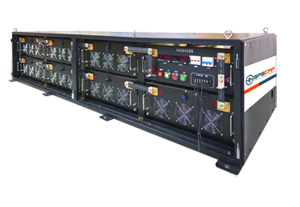 Provide safe and reliable vehicle-mounted complex power supply system to satisfy the demand by passenger cars for start-and-stop power, stead voltage, deceleration, braking energy recovery etc. Provide stored power for jump starter. Provide all-weather module solutions as the backup power to the pitching Control Systems of Wind Turbines, able to improve the reliability,safety and minimize maintenance cost. Provide safe and reliable vehicle-mounted complex power supply system to satisfy the demand by passenger cars for start-and-stop power, stead voltage, deceleration, breaking energy recovery etc. Provide stored power for jump starter. Provide module or integrated power supply for smart grid, applicable as backup power to automation equipment of distribution network, monitoring instrument, data transmission and actuator. Used as the complex energy storage system for micro grid, able to provide instant and up to megawatt class power compensation to improve the quality of electric power to micro grid. Provide backup power to the actuator of AMR, sensor to the Internet of Things, IT and communication system data storage and transferring, to improve the reliability and safety and reduce the maintenance cost. Supercapacitor is a new type of energy storage device between capacitor and battery. It has the characteristics of fast charging and discharging and energy storage function, but no chemical reaction occurs during the energy storage process.The device has unique characteristics such as high power charging and discharging, long cycling life, environment friendly, wide working temperature, maintenance-free and so on, so it has become a hot spot of research and application in new energy area. In China, the most widely used application for supercapacitor is on the braking energy recovery system of urban hybrid electrical buses. 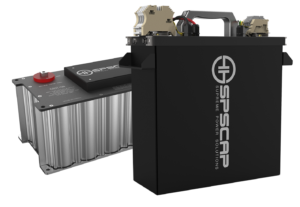 SPSCAP ® standardized ultracapacitor modules module consists of single cells in series or parallel connection. All are grouped strictly according to cell matching rules, and achieve a highly efficient voltage balance between EDLC capacitor cells, as well as a highly reliable structural design to ensure the module’s reliable and stable performance.When connected, ultracapacitor modules with the same range of capacitance should be selected as much as possible to ensure voltage consistent within a certain range when charging. Based on that, equalization circuit are mainly adopted to achieve the overall voltage balance. Ultracapacitor system, which consists of ultracapacitor, equipment case, iCMS, and other electrical devices, can be used in rail transportation, engineering machinery, micro grid.The ultracapacitors is equipped with capacitance equalizer to ensure the consistence of voltage in diﬀerent cells. ICMS consists of a monitoring unit with touch screen, a voltage and temperature monitoring and voltage-balancing unit, intelligent management software, etc. The system can monitor, manage and maintain the ultracapacitor system and activate the alarm when abnormal conditions occur to the capacitors. Other recommendation also be custom-made.